New findings from The Global Leadership Forecast 2014 | 2015 reveal insights on—and the impact of—selecting and developing leaders. With training resources at a premium and a seemingly insatiable need for more capable leaders, it has never been more important to make smart decisions about who to place in leadership positions and how to develop those individuals. New research-driven insights to help inform these decisions can be found in The Global Leadership Forecast 2014/2015. A joint effort by Development Dimensions International (DDI) and The Conference Board, this large-scale leadership study draws on input from 13,124 leaders and 1,528 global HR executives, spanning 48 countries. 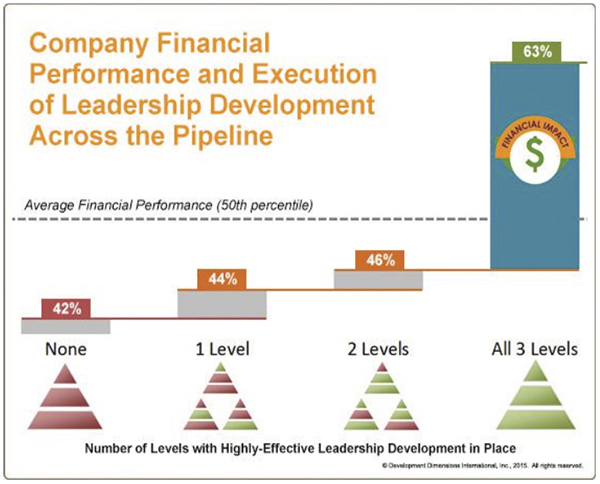 Our deeper look at the data also illuminates the powerful financial advantages exclusively seen by organizations executing high-quality leadership development across the full pipeline, from front line to senior level. Agile organizations possess the ability to anticipate trends, respond to problems, and adapt to change—important competitive advantages in today’s complex world. No surprise, agile businesses thrive with agile leaders and vice-versa. But what are the ingredients of leadership agility? 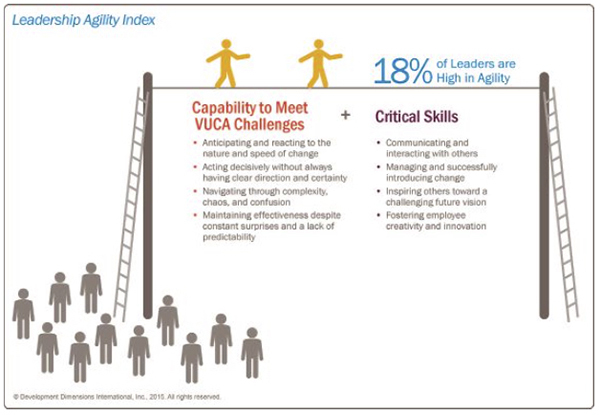 To explore this, we created an agility index by combining leader capability in the four components of VUCA (Volatility, Uncertainty, Complexity, Ambiguity) with leader effectiveness in core behavioral skills strongly linked to these VUCA outcomes. (The specific capabilities and skills making up this index are shown in the graphic below.) Across all leaders in our research, only 18 percent rated highly on this agility index—a clear wake-up call for those companies where agility is a mandate for survival and growth. Our forecast shows that the impact of an agile leadership pool—for those few companies able to achieve it—is enormous. We looked at a composite of metrics—profitability, earnings per share, five-year rate of return to investors, and stockholder equity—gathered from financial databases on 150 publicly traded companies. We found that companies with a larger pool of agile leaders (30 percent or higher) are able to reduce the time it takes a new leader to be fully capable by an average of three months. Organizations in the top 20 percent of financial performance are 5.8 times more likely to have a high proportion of agile-ready leaders than those in the bottom 20 percent. We also explored the relationship between rapid company growth and leadership agility. As you would expect, fast-growth companies have 35 percent more agile leaders than their no/slow-growth counterparts; however, in no/slow-growth companies, agile leaders are 32 percent less engaged compared to those in high-growth companies. They are also 47 percent more likely to be looking for another job. Simply put, agile leaders are likely to clash more often with—and to depart more quickly from—a company that is performing poorly or that has a highly conservative culture. This points to a potential trap when it comes to agile leaders: If you can’t follow through culturally and strategically, you will promote agile leaders at your own peril, as you will run a likelihood of losing them to more agile organizations. TO GROW OR TO GRAB? 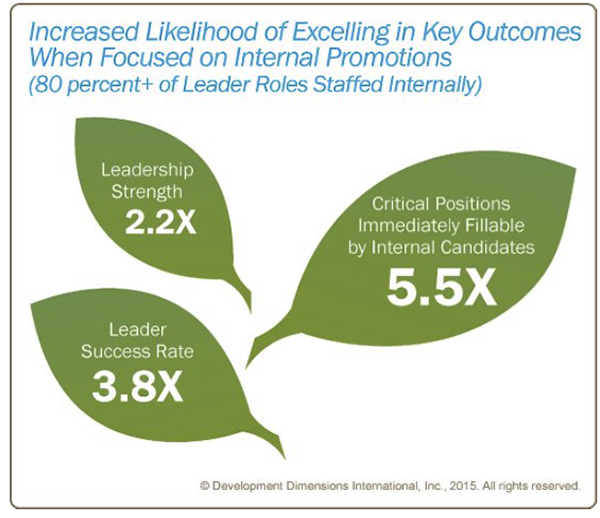 We found a consistent advantage to internally focused approaches for hiring and promoting new leaders in several key leader and organizational outcomes (see the graphic below). But there is a point of diminishing returns for promoting from within: 80 percent is the point past which the advantages of additional internal hiring for leader quality are minimal. The graphic shows how much more likely companies using an internally focused leadership staffing approach are to excel in key talent management outcomes, compared to companies hiring more leaders externally—these organizations are more likely to have higher overall leadership strength, i.e., a higher percentage of critical roles that can be immediately filled by internal candidates and a higher overall leader success rate. After you’ve spent a lot of energy and expense to find and hire the best talent, of course, you want to use the most effective methods to develop and continue to grow their skills. As leaders move up the leadership pipeline, how can you be sure to maximize the effectiveness of your development choices? To explore this question and to identify the most effective development methods across four leadership levels, we asked leaders to identify which methods are most effective for developing their skills. We also asked HR to tell us what methods their organizations are focusing on (see the graphic below). Leaders across the board, regardless of level, said that in-role assignments are most effective for developing their leadership skills, followed by formal training. Formal training appears to be more valuable early in a leader’s career to build the foundational skills they’ll draw upon later and increasingly is replaced by the value they receive from developmental assignments as they rise to the top. Coaching from one’s manager is the third most effective method, and in each case, leaders rely more heavily on the coaching they receive from their own manager than other sources of coaching or mentoring. 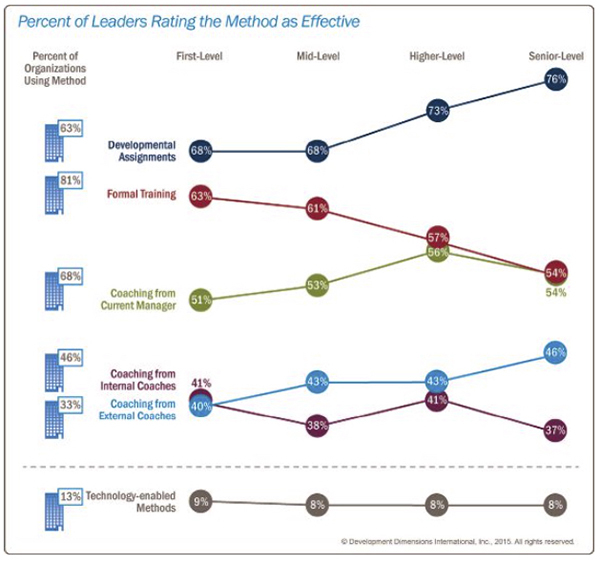 It’s worth noting, however, that even though external coaching is not as heavily utilized or emphasized (only a third of organizations are using external coaching regularly), it is incrementally more effective across the pipeline and more effective than internal coaching/mentoring for all but the first level. Why? The more complex challenges facing leaders at higher levels often require a greater level of sensitivity and impartiality that makes them better suited for external coaches and advisors. Ranking last in effectiveness are technology-enabled training methods such as instructor-led online training, and mobile-accessible and social learning applications. These methods may be less favorable when leaders have access to in-person development, but it is also worth considering that far fewer programs currently incorporate technology-enabled methods (only one in eight organizations), and as a result, few leaders may have enough exposure to or familiarity with them. Currently, these methods are more likely to be seen as supplements to formal learning or developmental assignments than as self-sufficient learning methods. This is likely to change, however, as more programs incorporate these methods (instructorled online training, mobile, social), and as organizations integrate technology more deeply within their learning strategies. Almost all companies have some sort of leadership competency model and spend millions developing and maintaining it. Is there a payoff? We explored what effect having clear information about the competencies/ skills areas and the specific behaviors needed to succeed as a leader has on engagement and organizational outcomes. From our analysis, it appears that the answer is “plenty”—but only if the necessary level of behavioral detail is built into these models. Leaders whose organizations provide information about both the competencies and specific behaviors needed to succeed are 2.8 times more likely to be highly engaged. That’s significant, considering that highly engaged leaders are 4.5 times more likely to stay with their organizations. Providing a clear picture of success better enables these organizations to hang onto their talent. While these results make a strong case for competency models, it must be pointed out that not all competency models are created equal. Those that provide the greatest level of detail—and which, in turn, can be tapped to build specific success profiles to guide assessment and inform selection, development, and promotion decisions—are the most likely to deliver the strongest returns. According to the Global Leadership Forecast, just 15 percent of organizations rate their future bench strength as strong. One reason is that their approach to leadership development has been isolated rather than integrated. The potential benefits of a total pipeline approach to developing leaders are that an alignment with strategic objectives is more easily attained when a common leadership language and level-appropriate skills are developed. In reality, however, fewer than one in five organizations successfully actualizes a true pipeline model. We asked HR respondents to evaluate the effectiveness of their development programs at the front-line, middle, and senior levels (see the graphic below, left). When we grouped the companies by the number of leadership levels that are rated as highly effective, the results are telling. Companies performed the worst, compared with their peers (falling in the 42nd percentile), when none of their leadership development programs were highly effective. On the other end of the spectrum, those with highly effective programs at all three levels were in the 63rd percentile compared to the others. Companies executing leadership development effectively at one or two levels increased slightly, but only those that successfully extended these programs across all three levels decidedly outperformed their peers. This significant discrepancy points to an unavoidable fact: When organizations place a concerted focus on developing leaders across the entire pipeline using a unified approach, the difference is visible in their bottom lines. Avoid the agility mismatch. Claiming to be agile but failing to back it up with decisive action and rapid decisions will only push your most agility-capable leaders elsewhere. Install frequent talent audits, strategic talent planning, and high-quality development systems that allow you to confidently promote leaders heavily from within. Build options and flexibility for leader development that take into account the methods leaders find most valuable, which vary notably across leader levels. Verify that your competency model outlines details at the behavioral level in order to see the full benefits of a competency approach to talent management. Target a full-pipeline approach to leadership development. Organizations that don't are much less likely to even achieve "average" financial performance. The findings highlighted here are in addition to those published in the Global Leadership Forecast report. Visit www.ddiworld.com/glf to learn more about the study and view all of the report findings. Evan Sinar, Ph.D., is DDI’s Chief Scientist and Director of the Center for Analytics and Behavioral Research (CABER). Richard S. Wellins, Ph.D., is a DDI Senior Vice President. Stephanie Neal, M.A., is a research associate in DDI’s Center for Analytics and Behavioral Research.